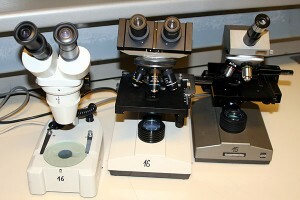 This article outlines some similarities and differences between compound and stereo microscopes. They have different, but sometimes overlapping, areas of application. Light microscopes (optical microscopes) that are commonly used in schools come in two flavors – compound microscopes and stereo microscopes (also known as dissecting or binocular microscopes). In research or medicine the range of optical microscopes is naturally larger, some of which are variations or adaptations of the above two types. Strictly speaking, Laser Scanning Confocal Microscopes also belong to the category of light microscopes, but for educational purposes in schools, they are not relevant. Compound microscopes: When confronted with the term “microscope”, most people will have a picture of a compound microscope in their head. Compound microscopes are used to observe small, thin, translucent objects. In many cases it is necessary to prepare the specimen before it can be observed. Stereo microscopes: These microscopes are designed to view larger, opaque objects. Translucent objects can also be viewed. The magnification is lower than in compound microscopes, but with the advantage of a stereoscopic view. Important: Compound microscopes with a binocular head should not be confused with stereo microscopes. Compound microscopes are not capable of delivering a stereoscopic (3D) image, even if they have a binocular head. Depth of field Low. It is possible to focus through the different layers of a specimen. High. Suitable for viewing thick objects. Illumination Bottom up. Light shines through the specimen from the bottom. Bottom up and top-down. Opaque objects can also be viewed with light shining from the top. The object then reflects the light (incident lighting or reflected light microscopy). Specimens Objects that can be cut very thin and still allow light to pass through. This includes many biological specimens. Objects that are thick and/or opaque, such as rocks, whole insects, animals for dissection or larger pieces of plant material. Can eukaryotic cells be observed? YES. Eukaryotic cells can generally be observed. It is also possible to see some cell organelles. YES. 40x magnification is sufficient to see the shape of larger eukaryotic cells such as onion cells. It is not possible to see cell organelles very well. Can prokaryotic cells (eg. bacteria) be observed? YES. The magnification is sufficient (400x-1000x), but the cells need to be stained if viewed in bright-field. NO. 40x magnification is generally not sufficient. The cells will be seen as small dots, if at all. What are some new technologies involving science within the last 2 years, 2008-2010?